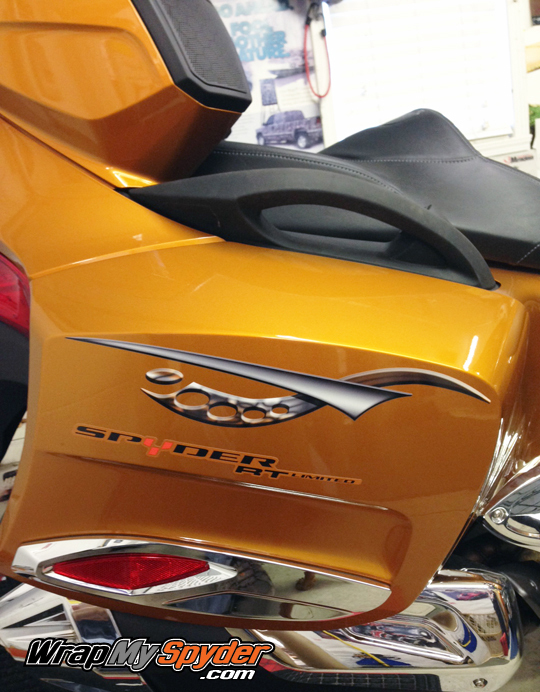 Cosmos Can-am Spyder decal kit is a shape cut vinyl graphics kit created for all models of the BRP Can-am Spyder. 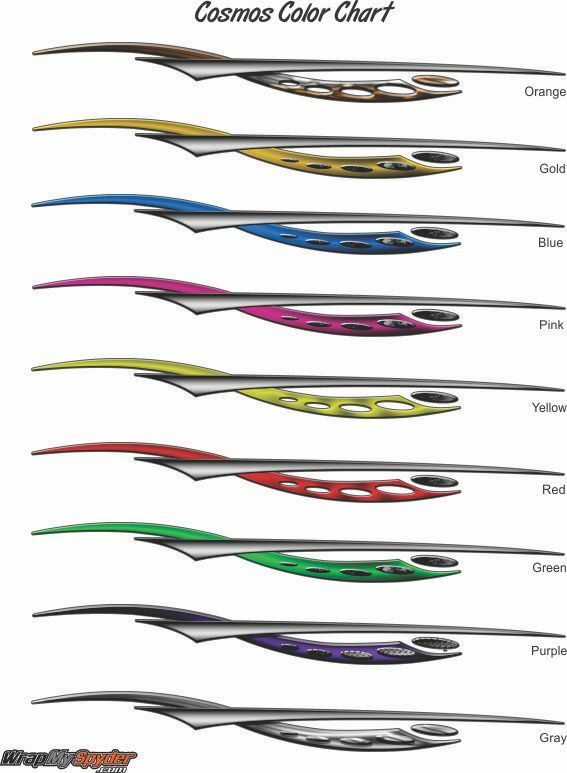 With 9 color options you are sure to find one that will suite the look you want for your bike. 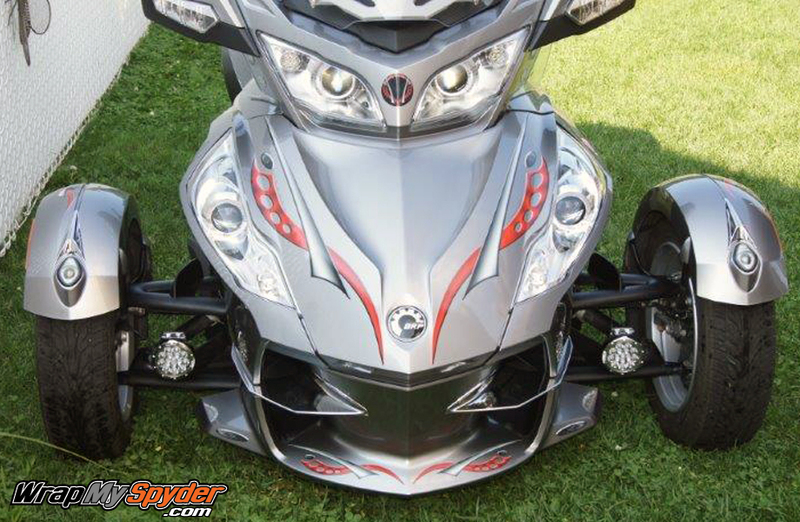 Create your own look with the freedom to place each piece on the machine just how you like them. Watch our application video to see how easy it is to apply this kit. Available for other models upon request. To be more visible when riding at night choose our reflective option which will make your complete kit illuminate at night when light hits it. You will receive these pieces in the kit: Frunk Outer and Inner, Behind Speaker, Saddle Bags, Lower Air-Dam, Back Bar and Extras. Refer to color chart to see how your kit will appear. 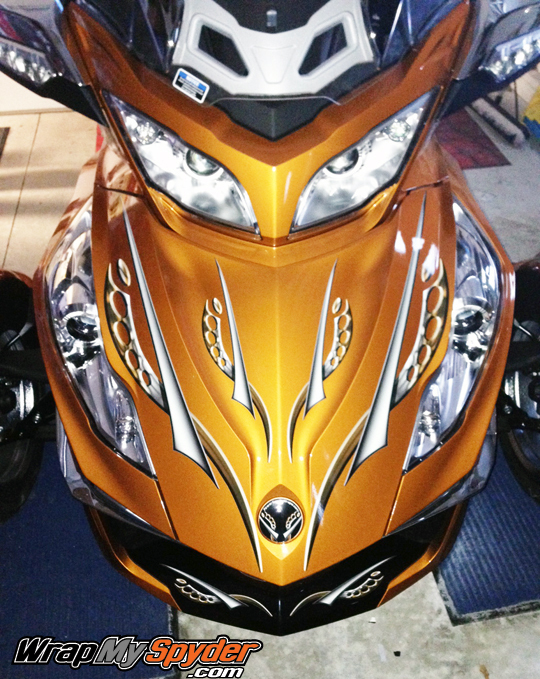 Easy to apply, this graphic kit was installed in less than one hour without any problem. The directions were simple and easy to understand. Even a novice (me) was able to “pimp” my ride. 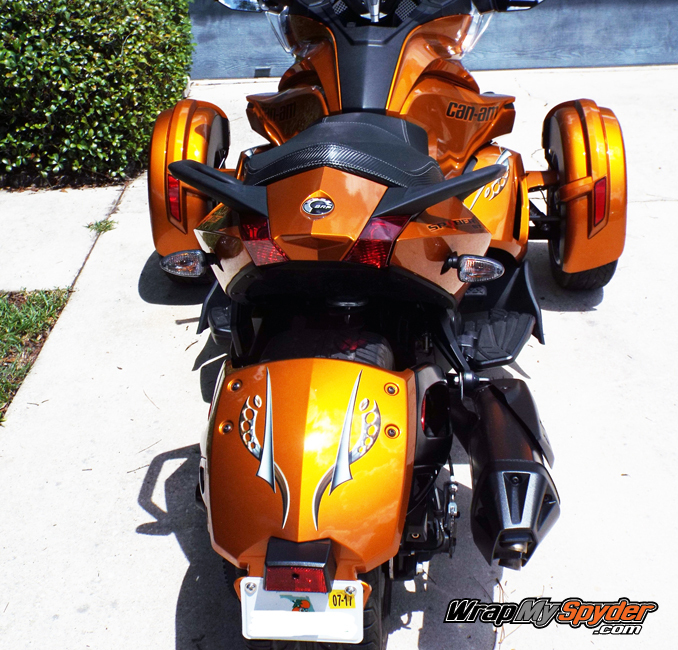 I have received numerous comments about the graphics and I have no one to thank except wrapmyspyder.com. 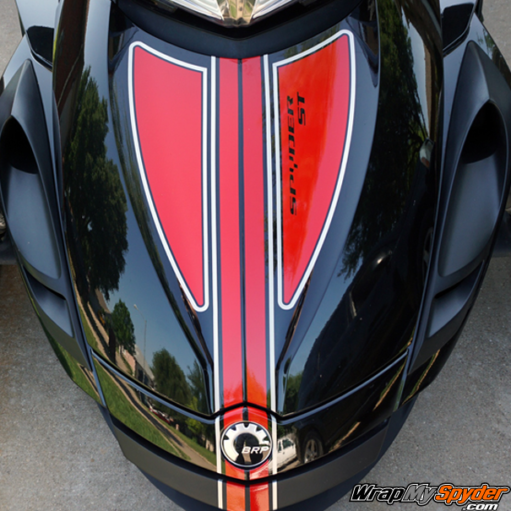 If you’re interest is putting graphics on your ride, please think about contacting Pete at wrapmyspyder.com. You’ll be glad you did! Discussed with Pete before ordering about what color would go best on my Lava Bronze RT Limited. We decided on Gold Cosmos. Order was completed and delivered faster than I expected. 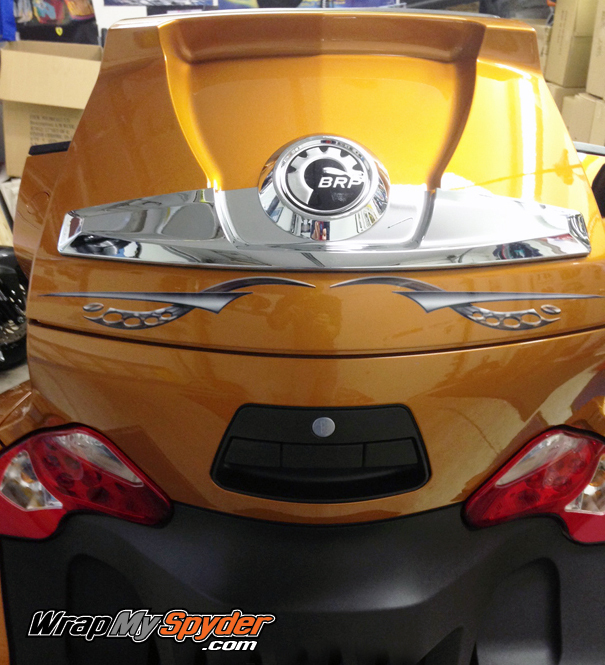 The kit was very easy to install, if you watch the video first. It is very helpful. 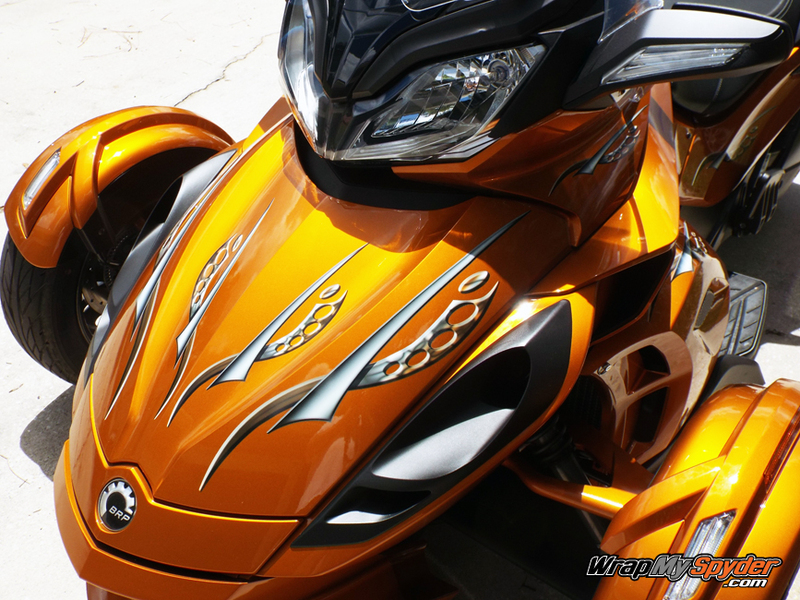 This kit just makes the whole difference with appearance of bike, not bland anymore. 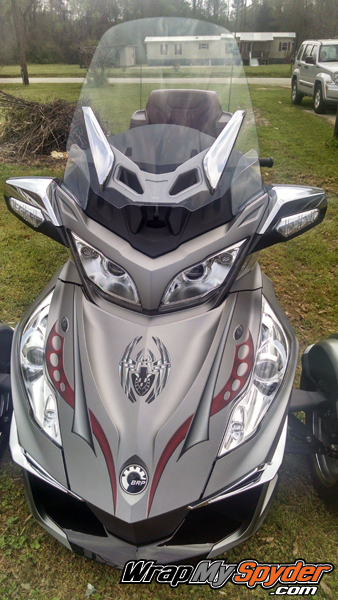 Pete also worked with me to get a few extra decals that will complete the look. 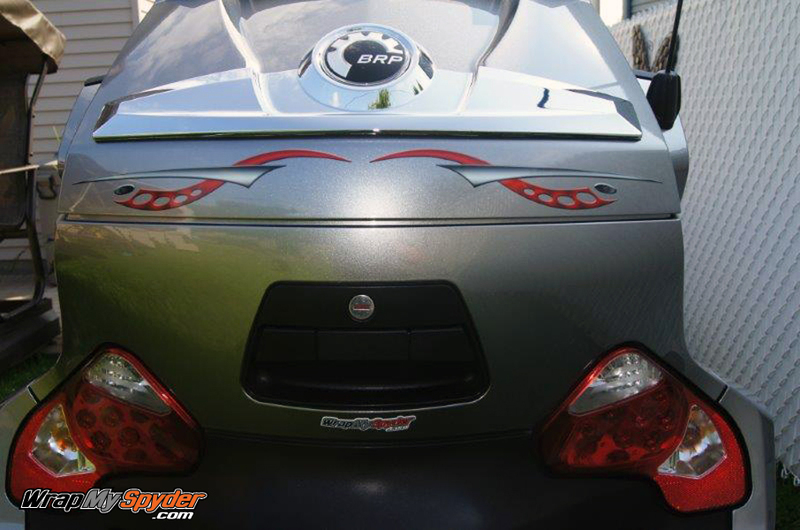 These are high quality decals and you will be pleased with the results, as I am. I have a 2014 Rt limited. 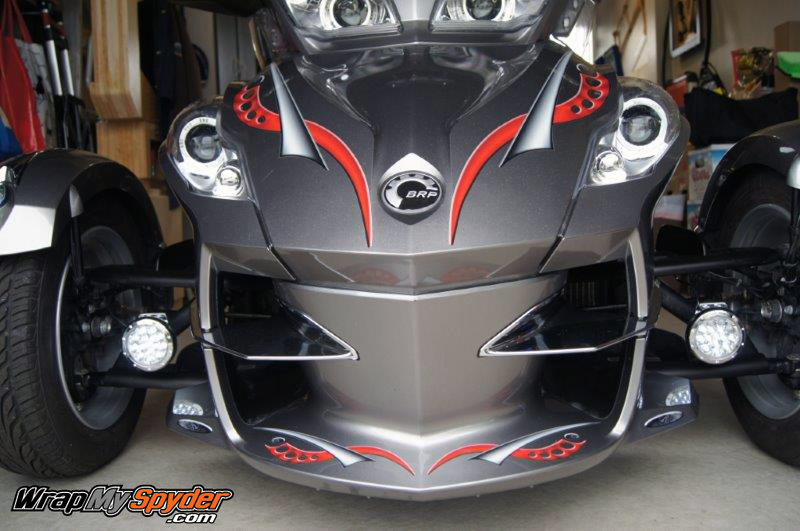 Its silver w/ burgandy seat. I liked the Cosmos kit but only had the red to go with it. I emailed Pete and sent him a picture. He darken the red to make a burgandy color and it matched perfectly. Love it! Thanks, Pete! 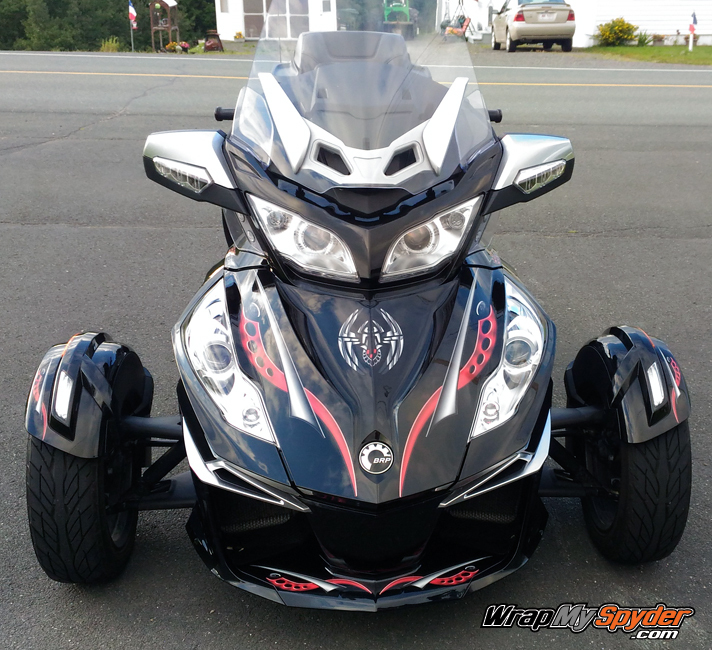 Pete and WrapmySpyder.com have been more than accommodating and helpful as we searched for just the right decals for our RT. When the standard decals didn’t work quite right for us, Pete customized our reflective decals to meet our needs or the color of our bike. We also want to share that the professional we had install them couldn’t be complimentary enough of the quality of work and materials. Thank you! 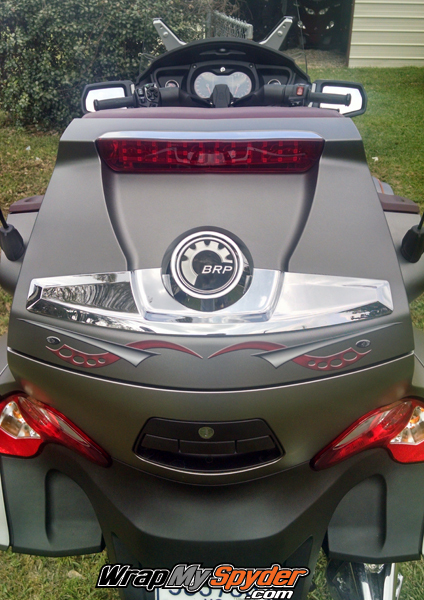 I recently purchased a set of graphics from http://www.wrapmyspyder.com/. 4. Any questions were answered rapidly and courteously. 5. Design your own graphic if you like. 1. I wish I would have found these sooner. After looking over the offerings for the RT my wife and I decided on the Cosmos Style. After ordering the kit came in just a couple of days. Suffice to say I was impressed with the quality and ease of installation! The kit also came with extra pieces in case we wanted to add more to our RT-S. I have to admit it took me (a Novice) a little over 2 hours to install the kit but that is because I measured and re-measured the graphics on the hood where most of my time was spent LOL. Overall I am very happy with the install and the quality of the graphics. When my wife arrived home from work she was completely overjoyed as we have recently gotten the RT and wanted to start making it our own! Kudos to Pete for a quality product and awesome help!!!!!! 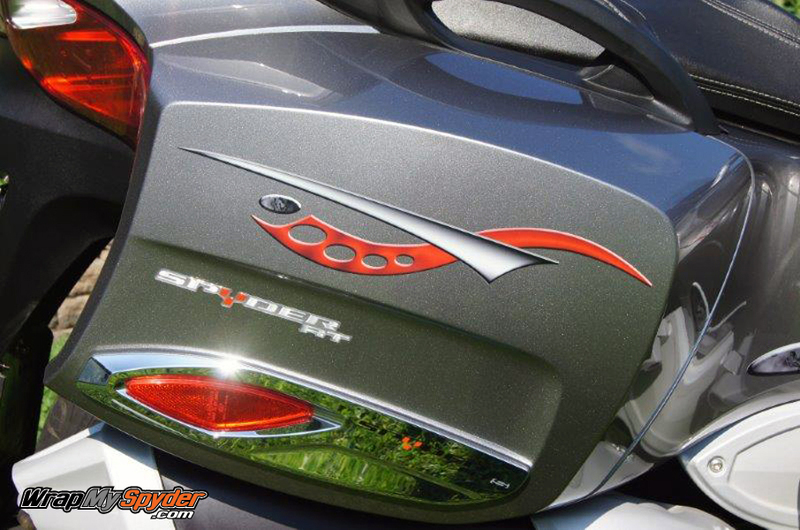 I highly recommend WrapMySpyder if you are looking to add a personal touch to your Spyder! 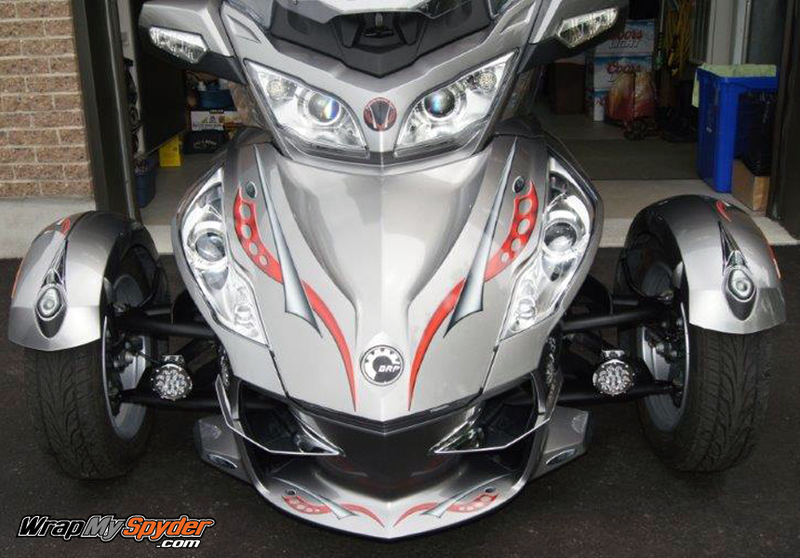 What an awesome way to really bring some character to your Spyder! I watched the 10 minute video and was doing it myself like a pro within minutes. Easy to install and looks amazing. 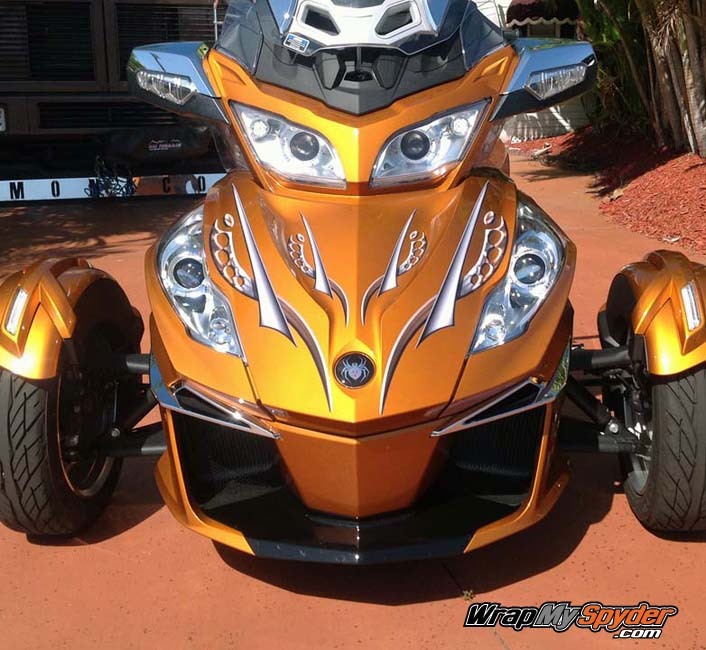 A custom paint job would cost $$$$$. With this product, you do it where you want and when you want (meaning that if I want to change it up, I just take it off now or 2 years from now). Lastly, the customer service is 5-star. Personal attention with whatever you need. You will not be disappointed in any aspect of your purchase. 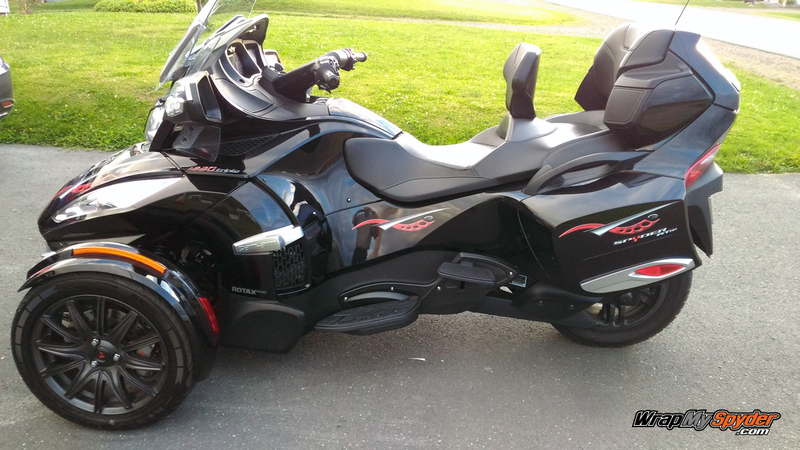 The 2015 Canam Spyder RT SE6 Standard only comes in black in the UK. 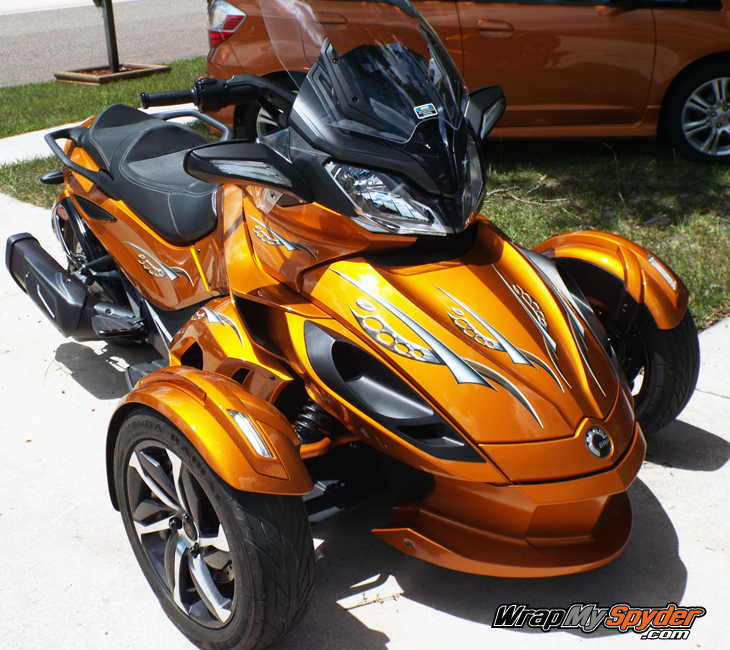 I thought it could do with a bit of colour to brighten it up and searched the Wrap My Spyder website for a suitable graphics kit. I chose the Cosmos kit as I did not want to overdo it with too much colour and chose the yellow as a nice contrast. The kit was duly ordered and shipped very quickly, the only delay being at customs who did not release it until they had got their 20% VAT. It arrived this morning and took about an hour and a half to install. I took my time with proper preparation and taping as shown on the installation video. This was a very easy install and I am very impressed. 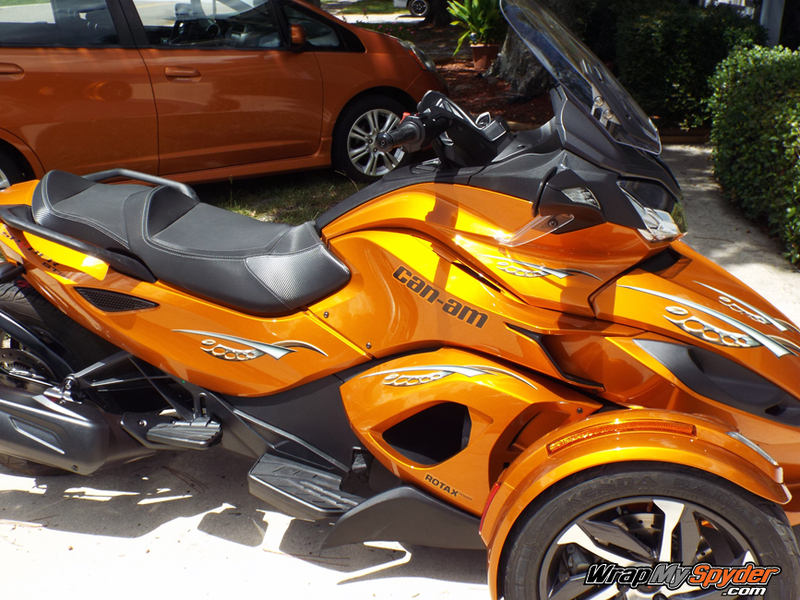 It certainly looks good on the trike. 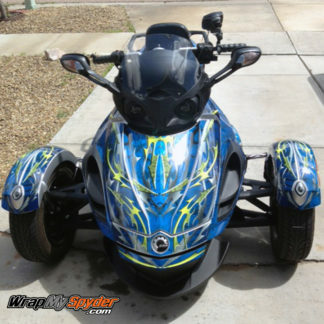 Thank you Wrap My Spyder for an excellent piece of kit and great service. 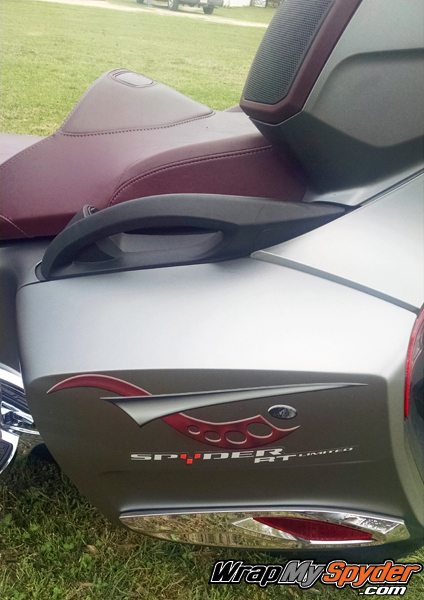 I purchased the Cosmos burgundy for my 2015 Special edition can am Spyder RT. easy install following the directions provided. Pete also provides a YouTube video to help with installation instructions. Great company to work with. Just recently purchased the cosmos kit and was very pleased with the service from the time the order was placed till it was received. Was kept up to date the whole time. Watched your video and had no problem at all. The kit looks great and have had nothing but compliments on how good it looks. Great product, Thanks Pete! RECEIVED MY COSMOS SET ON MAY 14 AT ABOUT 1:00 P.M. STARTED INSTALL AT 2;00 PM.FINISHED INSTALL ABOUT 430 P.M. AND ON MY WAY TO COLUMBUS AT 500 P.M. VERY EASY AND SIMPLE INSTALL,AND MAN DO THEY LOOK GREAT.HIGHLY RECOMMEND. DOING BUSINESS WITH SUPPLIER WAS ALSO GREAT.THEY ARE VERY HELPFUL. 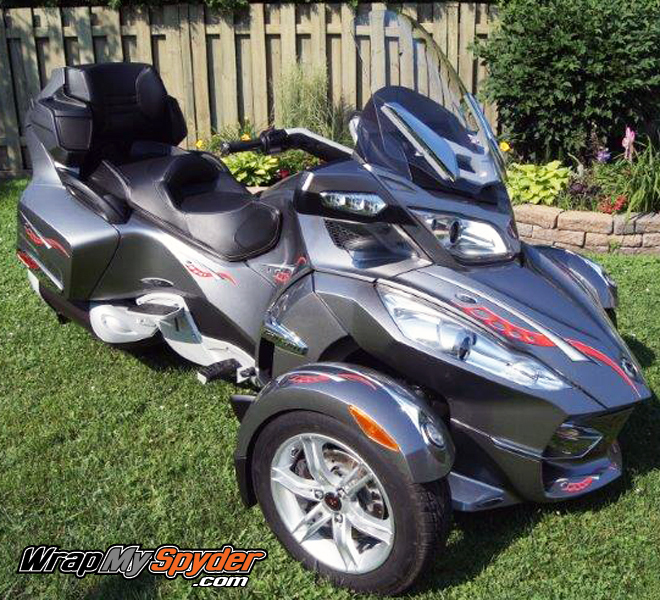 I wanted something to set my Spyder apart from others. 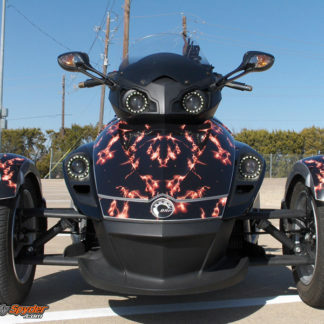 Saw the Wrap my spyder on Youtube and watched the video. Ordered the Cosmos kit and followed the instructions to install. First time I had ever done anything like this and the result were perfect for me. 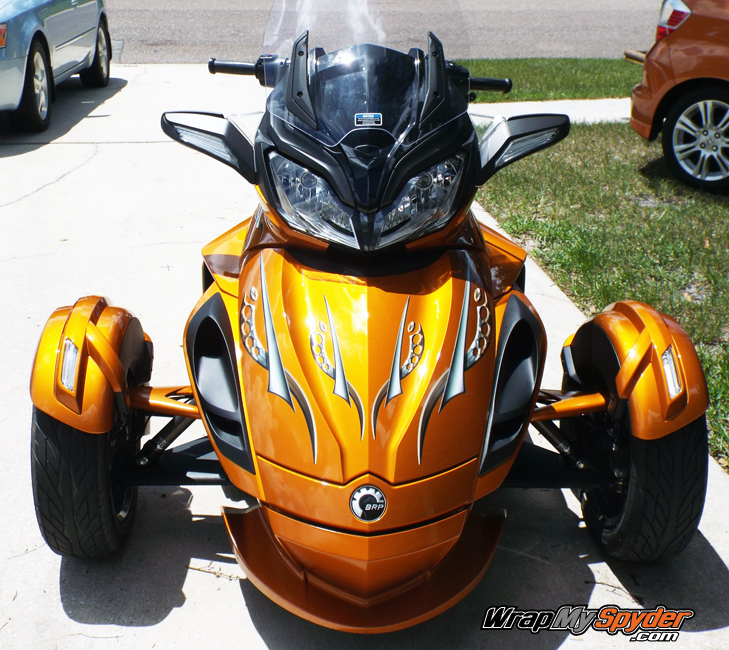 This is a good product to use works as stated and really sets the look of my trike. Product is very high quality and very easy to install!!! And you have lots of decals in a kit!!! PS: I live in Canada and it only took 4 day’s to arrive with Fed Ex. 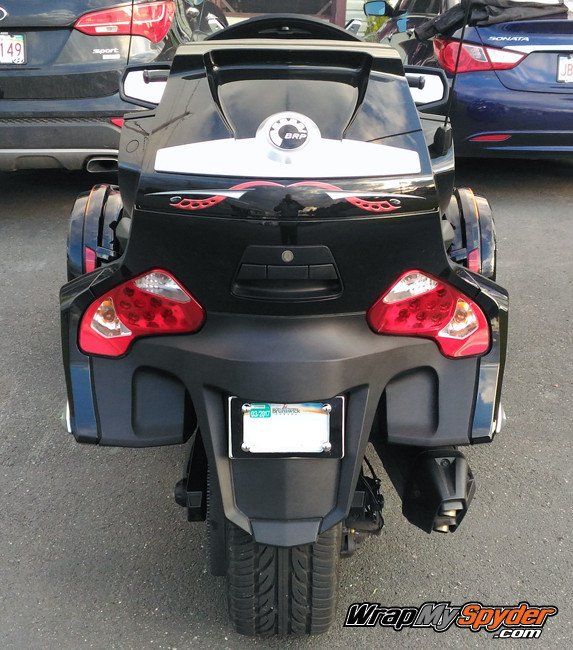 After searching many online vendors for the best quality decals I came across http://www.wrapmyspyder.com and my search was over. I purchased the Boren spiders and the Cosmos graphics to design a unique design to which I get many complements on my bike. I highly recommend any of the graphics they offer.